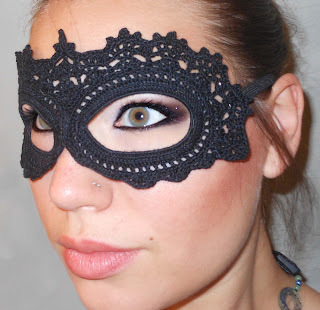 Here is a pretty mask pattern. Plenty of time left to have it ready for Halloween! Small swatch of matching fabric, ribbon, or swatch of crochet made with your yarn. 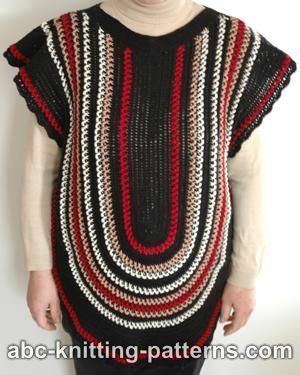 I love love this poncho, and I usually don't like ponchos! "With thick wool and yet feminine!" 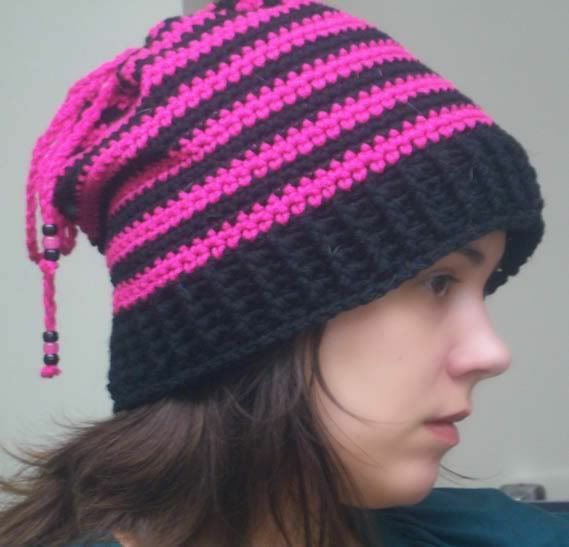 DROPS CROCHET HOOK SIZE 12 mm/US O - or size needed to get 6 tr = width 10 cm / 4'' (1 repetition of A.1 measures approx. 8 cm / 3 1/8'' in width, 1 repetition of A.2 measures approx. 10 cm / 4'' in width). "A basic pattern for a swirl hexagon/ circle. 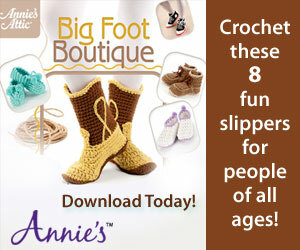 You can crochet as many rounds as you want, so the size is up to you." "I've always loved those mini top-hats you see floating around now and then, and I thought it would be super cute to make a Halloween version. " "I wanted to make a scarf that was light and airy, soft and romantic." 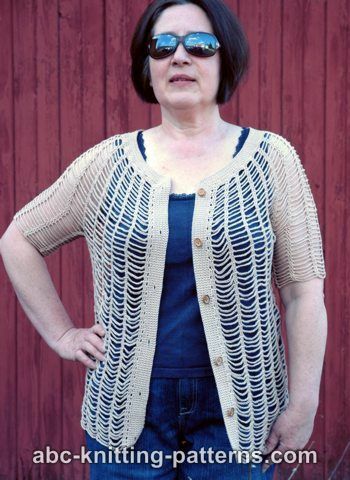 A different view on the cardigan. I like this unique mesh chain style pattern, very cool! Cuffs, armlets, wristers, these arm coverings can be called by several names. I've been seeking a lacy style pattern, and after many hours searching, I ended with nothing. Therefore, I decided to whip up my own. These long lacy crochet arm cuffs are elegant and have a vintage vibe, exactly what I was looking for! 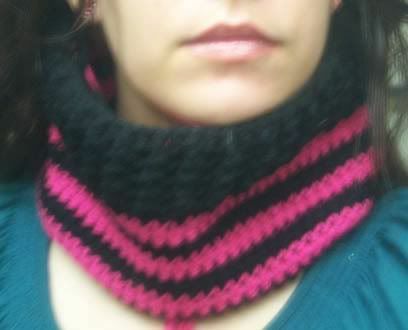 A great way to keep your arms warm (but not too warm) this fall and look stylish too! I would love to share my pattern with you. This pattern is owned and copyrighted for Fintage Vintage, 2012. You may make these for your own personal use and for selling at live events such as craft fairs and markets. Online selling or copying of this pattern or the finished product is not allowed. Ch 25, sl st to 1st ch to form a loop. Ch2. Do not turn. Rnd 1: 9 dc in the 1st ch. Ch3. Turn. Rnd 2: Tr in the 1st dc, shell, tr in next dc, ch3. Turn. Rnd 3: 9tr 1st st, shell, 9tr in last st. Ch3. Turn. Rnd 4: Tr in 1st st, (shell, tr in next st)3 times. Ch3. Turn. Rnd 5: 9tr in 1st st, (shell, tr in next st)twice, shell, 9tr in last st. Ch3. Turn. Rnds 6 and 7: Tr in 1st st, (shell, tr in next st)4 times, shell, tr in last st. Ch3. Turn. Rnd 8: Tr in first st, (shell, 2tr in next st)4 times, shell, tr in last st. Ch3, Turn. Rnd 9: Tr in first st, (shell, tr in next 2 sts)4 times, shell, tr in last st. Join to opposite side by working a sl st to the top of the 1st tr of row. DO NOT TURN. Do not turn from now on. Rnds 10 to 13: Tr in 1st st, (shell, tr in next 2 sts)4 times, shell, tr in last st. sl st to beg tr. Ch3. Rnd 14: Tr in 1st st, (shell, tr in next st, 2tr in next st)4 times, shell, tr in last st. Sl st to beg tr. Ch3. Rnds 15 to 17: Tr in 1st st, (shell, tr in next 3 sts)4 times, shell, tr in last st. Sl st to beg tr. Ch3. Rnd 18: 2tr in 1st st, (shell, tr in next st, 2tr in next st, tr in next st)4 times, shell, tr in last st. Sl st to beg tr. Ch3. Rnds 19 and 20: tr in first 2 sts, (shell, tr in next 4 sts)4 times, shell, tr in last st. Sl st to beg tr. Ch3. Rnd 21: Tr in first 2 sts, (shell, tr in next 2 tr, 2tr in next tr, tr in next tr)4 times, shell, 2 tr in last tr. Sl st to beg tr. Ch3. Rnd 22 and 23: Tr in first 2 tr, (shell, tr in next 5 tr)4 times, shell, tr in last 2 tr. Sl st to beg tr. Ch3. Rnd 24: tr in 1st tr, 2tr in next tr, (Shell, tr in next 2 tr, 2tr in next tr, tr in next 2 tr)4 times, shell, tr in last 2 tr. Sl st to beg tr. Ch3. Rnds 25 and 26: Tr in 1st 3 tr, (Shell, tr in next 6 tr)4 times, shell, tr in last 2 sts. SL st to beg tr. Ch3. Rnd 27: Tr in 1st 3 sts, (Shell, tr in next 2 sts, 2tr in next st, tr in next 3 sts)4 times, shell, 2tr in next st, tr in last st. Sl st to beg tr. Ch3. Rnds 28 and 29: Tr in 1st 3 sts, (shell, tr in next 7 sts)4 times, shell, tr in last 3 sts. Sl st to beg tr. Ch1. A hip cap for the fall! "Elegant wristers! Reminds of a seductive jazz songstress." Supplies: AUNT LYDIA’S® “Bamboo Crochet Thread” Size 3: 2 balls 0012 Black. Crochet Hook: 4mm [US G-6] and 3.5mm [US E-4]. Yarn needle, 20” black elastic (optional). Size: Wristers measure 15” long to thumb. Directions are for one size. Halloween is coming soon! 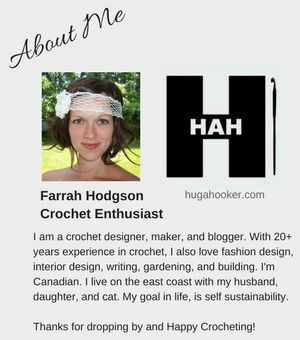 It's a fun time for crochet! Here's a very simple and cute wig pattern. 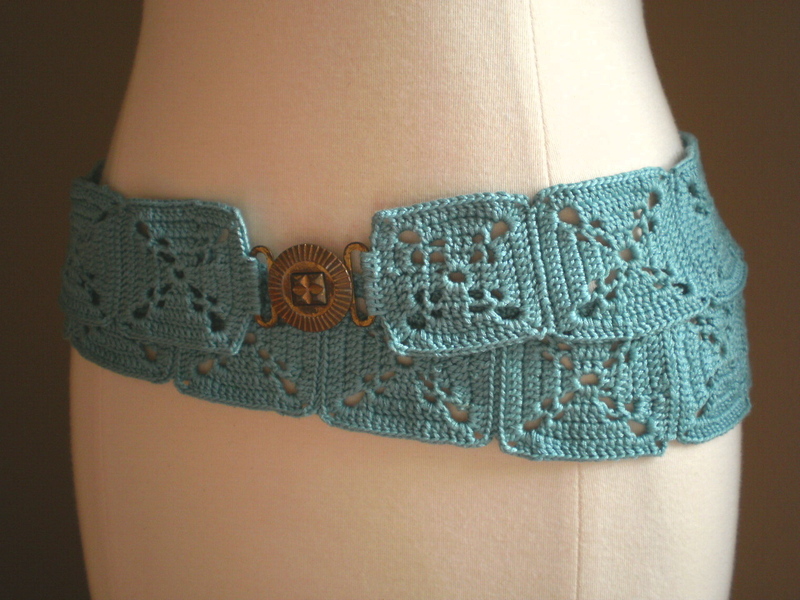 "A wonderfully cool accessory, this uber-hip belt gives crochet a new swagger." Notions: vintage belt buckle, not D rings. "Stunning in red! Autumn is approaching and you need splashes of pick-me-up colours." crochet hook size 3 mm [C] – or size needed to get 24 dc x 13 rows = 10 x 10 cm [4’’ x 4’’]. It's not cold enough for winter hats yet, so give this awesome visor a try! 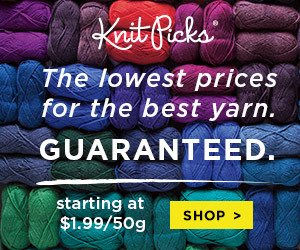 Material: Red Heart Comfort, or any worsted weight yarn. Finished sizes: Measure 19" (20", 21") in circumference. Directions are for small, changes for medium and large are in parenthesis. 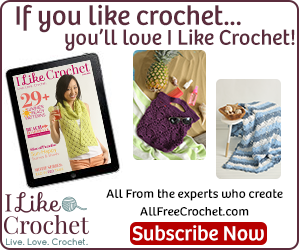 I love crochet ottoman covers! It's an easy way to liven up a room, and easily transform an old ottoman into something new. "Watch your favorite team with your feet up on a footrest with your team’s colors! 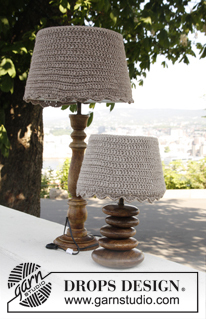 This ottoman cover is crocheted using yarn that changes color automatically. " Supplies: RED HEART® Team Spirit™: 5 skeins of 960 Orange/Navy OR 940 Red/Blue. Yarn needle, 14½” x14½” x14½” Ottoman. Size: Cube cover measures 14½” x 14½”. "Steampunk fashion draws largely from Victorian-era styles and designs. One item common between the two styles are spats, fabric cuffs that go over boots"
Materials: Light weight yarn and a size F hook. 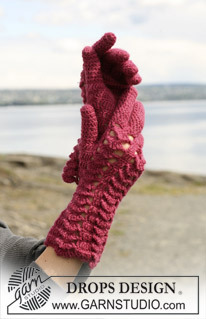 Size: Finished size will vary based on yarn selection, hook size, and tension. Note: This pattern is written for making the right spat To change the pattern for the left foot, work R10 in back loops only instead of front. I really like this vest! It is artsy, elegant, and chic all at once! Materials:Aunt Lydia's 100% Mercerized Cotton Size 3 150yd/138m black - 14 balls. Aunt Lydia's 100% Mercerized Cotton Size 3 150yd/138m red - 1 ball. Aunt Lydia's 100% Mercerized Cotton Size 3 150yd/138m white - 1 ball. Aunt Lydia's 100% Mercerized Cotton Size 3 150yd/138m light brown - 1 ball.